As a general practice, I try to eat fresh foods, using canned goods only in a pinch, but a recent cruise to Alaska has me reconsidering one canned item in particular — salmon. Here’s the short version of my “aha” moment. My knowledge of fish in general is limited, so while in Alaska I signed up for a fish-focused cooking demo. The instructor, a retired commercial fisherwoman, entertained us with fish stories, taught us a bit about the nutrition of fish, showed us how to identify quality salmon, filleted a fresh catch and then treated us to the best damn grilled salmon I ever had. It was all very informative and fun … and then she confessed that the appetizers we were munching on were made with canned salmon! Good grief — I didn’t come to Alaska for canned salmon! My hand went up like a shot and I bombarded the instructor with accusations questions. She went on to politely explain why both fresh and canned salmon should be part of your diet. Salmon is the number one choice when it comes to healthy fish; it’s full of vitamins, minerals and omega-3 fatty acids. A five-ounce serving of salmon is low in calories and high in protein (36 grams!) and will keep you feeling full for a good long time. And these are all good reasons to eat salmon, but why choose canned? Cost: A pound of wild caught salmon (16 ounces) typically costs between $15 and $18; a large can of the same salmon (14.75 ounces) runs around $4. Convenience: A can of salmon has a shelf life of five years; fresh fish should be used within two days of purchase. With a can in the cupboard, you’ll always have a fallback for a quick and healthy meal – pile it on a bagel with a squeeze of lemon for lunch or whip up some last minute salmon cakes for dinner. Nutrition: Nearly 2/3 of the nutritious omega-3s are found in the fatty gray tissue directly under the skin; and the soft bones are an excellent source of calcium. 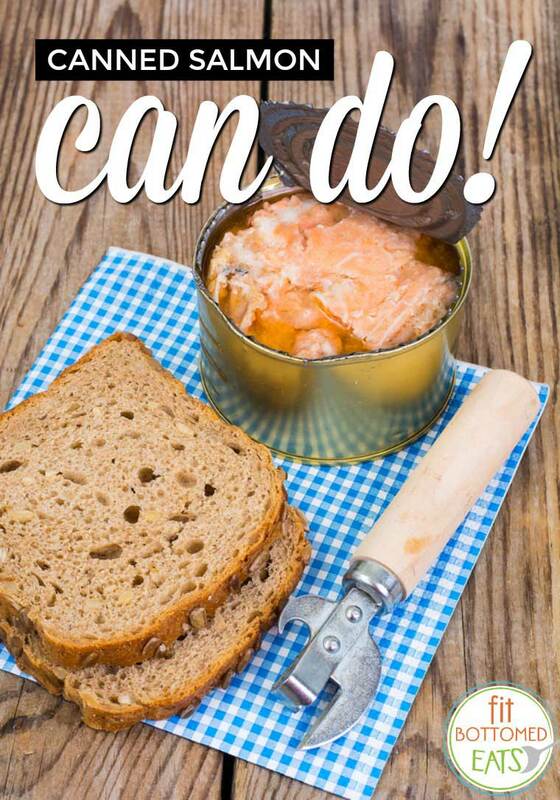 Traditional canned salmon comes with the skin and the bones intact; both are edible (just mix ‘em right in you’ll never know they are there), you’ll get slightly elevated levels of omega-3s and as much calcium as you’d find in a glass of milk. Logistics: Salmon does have a season and unless you live near salmon country, chances are your fillets have been flash-frozen to preserve the quality. Canned salmon has its freshness sealed right in and nearly all brands are wild-caught. Bonus: The oily liquid that forms on the top of the can comes directly from the fish and is highly nutritious. Save it and mix with olive oil and minced onion for your salad or stir a spoonful into your Bloody Mary to even out the flavor. If you want to make Fido happy, sprinkle some over his kibble for a super shiny and soft coat. I loooove Salmon, and after doing the 10 in 4 eating challenge (Salmon and greens salad is my fave!) I always try to have some in my cabinet. Thanks for the information about Atlantic and Alaskan salmon – good to know.